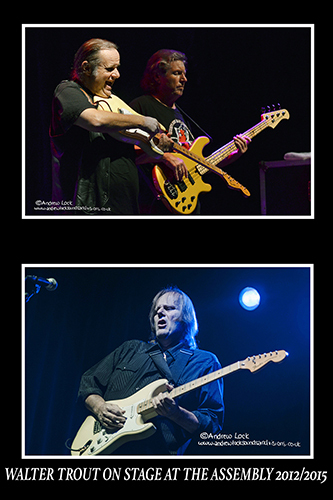 Blues legend and ex Canned Heat/John Mayall’s Bluesbreakers member Walter Trout returns to the Assembly on Wednesday 10th May. A fairly regular visitor to the venue (at least 2 previous appearances) during his lengthy and successful solo career he last performed there in 2015 not long after his well publicised serious health issues and on the brighter side hot on the tails of his then brand new, blistering studio album Battle Scars. I along with many reviewers gave the Battle Scars album a 10/10 review and that Assembly show also reached the same giddy heights (you can find my reviews of both the album and show on my web site www.andrewlocksoundsandvisions.co.uk). Walters guitar work leaves us lovers of blues rock watching and listening in awe, his vocals have a rich, grizzled tone full of character, his band is always top draw while his banter with the fans he loves such much (of course this goes both ways!) is up there with the very best in the business. This show is part of his huge 2017 “Alive” tour which takes in the UK and Europe before returning to his homeland the USA for an extensive trek. The set on the 10th May should include choice cuts from his back catalogue, hopefully a good chunk of the incredible Battle Scars album and a few of his takes on classic blues numbers and if we are lucky a few of his legendary stories.